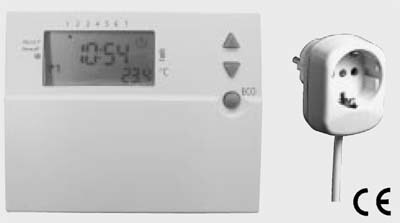 The control device consists of an electronic room temperature control device with integrated timer in a plastic housing 112 x 90 x 35 mm for easy wall mounting. Self-acting room temperature delay time control. 3 V = two alkaline cells, type LRG, mechanical reverse battery protection. Day and week programmes / 5 storage locations / floated battery circuit On-Off / antifreeze setting +5°C / Permanent Comfort +21°C fix / auto-operation / holiday programme / party setting. Electronic room temperature control from +5°C to 39°C, adjustable in 1°C - steps, AC 230 V, max. 6 A active load. 1,2 m long lead with shockproof attachment plug. Individually packed in cartons 210 x 140 x 65 mm.